Impressive Midwinters win for Ben with 9 bullets out of nine races. The Class in the US continues to gather big numbers as shown at Isla Morada Worlds. Ben will be for sure a menace at the 2013 Europeans. No pics from the event available. Only report by Bob Hodges at Sailing Anarchy - Note that Bob says "Scheurer G6" but he is confused I guess, Ben will race the 'D3' at Barcelona. As informed weeks ago Andy Scheurer will continue to produce the Scheurer G6 (Landy's boat) and his son Dominik is building the 'D3'. Photo Kristofer West from Aarhus 2011. 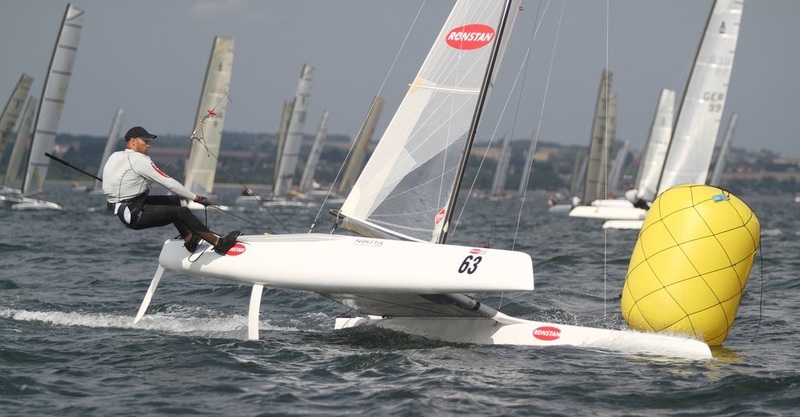 By Bob Hodges - "Aussie A-Class sailor Ben Moon currently living and working in the US for RONSTAN did his boss proud by winning the 2013 RONSTAN A-Class Catamaran US Midwinter Championship sailed at the Davis Island Yacht Club in Tampa, FL this past weekend. Moon dominated the 22 boat fleet in a 9 race series with a perfect score of all firsts. His upwind sailing showed a height and speed mode that no one in the fleet could match.